This month I've been excited about many things fashion wise. My birthday is rapidly approaching which has got me thinking about a birthday dress. I might have found it yesterday but I won't show to you until the big day, just so I won't spoil it for my friends coming to celebrate little old me getting older in one and a half week. Elle Finland's March issue reeks of spring! Here are some of the things that got my attention when I browsed through the mag. 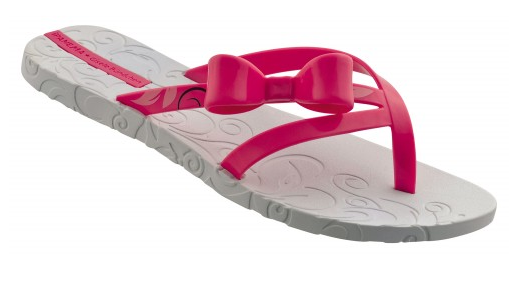 I fell in love with these flip flops designed by no other than Gisele Bündchen herself. Look how lovely and girly they are with bows! And one of their best feature - look at their price! You must think I'm mad looking at flip flops with tons of snow outside my window, but I think this is the perfect time to dream about summer. After all, isn't dreaming about something what makes it so much better when it actually happens? ..followed by Alexander McQueen's and Prada. Love the coral fluffiness and the baby blue midi skirt! Yves Saint Lauren and Chanel keep it simple but ever so elegant. These looks I would say suits best the office, or what do you think? Givenchy and Giorgio Armani rounds off the trend with mermaid and sculpture like soft red and strong green. Elle takes it one step further and shows us also how to create the perfect coral color look! I loved this page with pink pieces of clothing! In my childhood my family had a sailing boat. Ever since there has been a true love story between me and sailing related clothing, maybe because it reminds me of my childhood. Go figure. I love, love, loved this spread about the so called pirate look of the yacht club, haha. Funnily enough I recognized Bill Blass' look in the lower right corner of this spread while flipping through the magazine, since I mentioned it in September last year in one of my blog post. You can see what I then wrote here. Seemingly I have something in common with the editor of Elle Finland. I guess it's true what George William Curtis once said: "It is not the ship so much as the skillful sailing that assures the prosperous voyage." It doesn't always necessarily need a fashion magazine to spot superb catwalk looks. i couldn't agree more, its so ironical to be cold outside and watching summer clothes and flip flops, and oh don't you forget all the video clips featuring beaches and summer parties. love all the pastel colors featured here, i should definetely check out elle finland's march edition for interesting editorials. did you see any interesting editorial for me to feature in my blog? I'm sure you'll find lots of interesting editorials at http://www.elle.gr/. I am all for pastel colors this season...Nice post !! Thank you for your kind words Francesca! Thanks so much for sharing these photos! Love the Alexander McQueen dress! Thank you, I'm happy you liked the post! Kiitos! Mukava kuulla et säkin pidät niistä! Haha these are merely some spreads that have inspired me, the complete magazine is probably 10 longer! I'd like to think that fashion magazines are furthermore different all around the world, which I find interesting.